The EstLat-Accelerate programme started with a mentoring academy in Tartu on the 8th of November. Each team got a personal mentor who will help the team leader to focus on the most important things throughout the pre-accelerator programme. There were two more workshop days - on 30th of November in Riga and on 12th of December in Tartu. All team leaders got to visit Riga Digital Freedom Festival and Slush! They did a really good job by taking part in the workshops, networking and getting new ideas to develop their businesses! Captain Corrosion OÜ - We are providing corrosion consultation, corrosion testing and materials characterization services. DeltaHeroes - We want to help companies in finding international partners via smart matchmaking platform. Ketita Labs OÜ - Commercialize near-term quantum computing with hybrid quantum-classical neural networks. ZEITGEIST - It is both a web platform for films and music as well as a constantly evolving cultural archive for future generations to look back on, listen to and experience. TRIT - makes translators more visible, more resource efficient and placing orders easier. CalenDays - AI-powered Personal Assistant for time & project management that automates your planning actions. CYBERME.LV - We are teaching the Cybersecurity competences for kids and teens! FinanceFlow - We provide a platform for cash flow management for company owners. Scan&Buy - Mobile application which allows buying products from a visual advertisement or visual material. 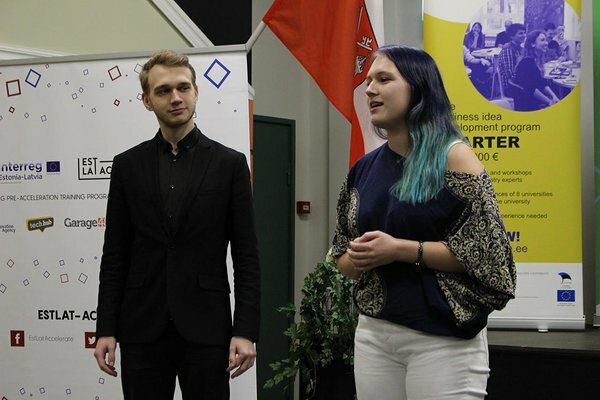 EstLat-Accelerate is a pre-accelerator programme to facilitate the development of the Latvian and Estonian startup environment, which was launched under the auspices of the European Regional Development Fund’s programme Interreg Estonia–Latvia 2014–2020. The programme is implemented in accordance with the cohesion policy’s goal of promoting European territorial cooperation. The programme offers the opportunity to develop cooperation between Estonia and Latvia, which began with the fulfillment of the Estonia-Latvia-Russia INTERREG IIIA Priority within the Baltic Sea Region INTERREG III B neighborly relations programme in 2004 and the Estonia–Latvia programme from 2007–2013. The EstLat-Accelerate project is part of the European Regional Development Fund programme Interreg Estonia–Latvia. The project’s partnership cities are Riga and Tartu. They are both represented by five partners, i.e. the founders of the local startup community – the Latvian Startup Association Startin.lv, TechHub Riga, Tartu University, the Garage48 foundation and the Baltic Innovation Agency.